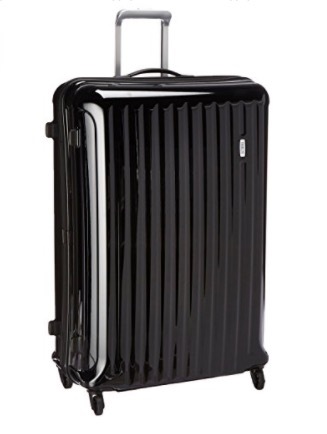 Bric’s Riccione series 32-inch spinner luggage is quite large inside and out, but very light with a 10.7 lb. weight despite the solid and durable construction. Please note that this is not as part of a set but a single large suitcase and the price tag is simply a reflection of its awesome quality. It delivers more than what it costs. Riccione 32-inch is offered in three different colors of shiny black, shiny blue and shiny red and look good in whichever color you choose. It has the European- Italian design and is an imported product. It is built durable and to last with the flexible makrolon polycarbonate material with a shiny and reflective finish, and includes nylon lining inside. The interior panel is nicely zippered (with the great quality YKK zippers) and enables flat and safe packing of your clothes. You will find an interior zipper pocket that you see in the photo on one side and the X-cross strap will make sure all your stuff is nicely secured. This solid 32-inch Bric’s Riccione weighs just 10.7 pounds, measures 22 x 13 x 32 inches, includes very spacious inner compartment. 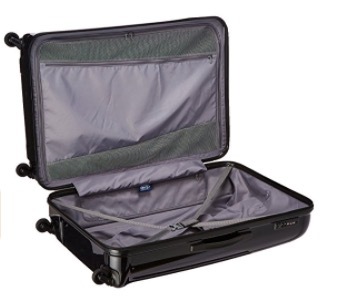 And it is designed for longer trips, like for when you’re going away for a couple or a few weeks. The polycarbonate material used in Riccione bags are solid and flexible and are resistant to stains, water- rain. The 32-inch Riccione is a spinner bag and is easy to move around with the 360-degree rotating wheels that glide easily on different surfaces. And it includes the handles that can be pulled up and locked at different positions. Although it is not cheap it will last for many years of frequent traveling- the quality is top class. It is resistant to shocks and impacts and you would need to try hard to damage it. Riccione Suitcase looks rather beautiful too with its sleek and futuristic design and shiny reflective exterior. Bric’s was founded in Como, Italy in 1952- so these great bags have about six and a half decades of history. It is still a family operated business despite having many stores worldwide. Bric’s is a luxury travel brand and Bric’s bags are used by many celebrities, socialites and even fashion designers as they appreciate the great handmade craftsmanship, aesthetics, beautiful design, build quality, functionality and durability. The Riccione 32-inch is offered with a limited 5-year warranty by the manufacturer and you can be certain nothing will go wrong unless it is abused.